Kale is one of those vegetables that people either love or hate. The mere mention of it draws verbal reactions of either extreme. I was on the hate side for a long time. It was fine cooked in soups and stews but to eat it raw made me cringe. (I think I had to overcome my vision of it as an uneaten garnish overused by caterers in the ‘70s and ‘80s). 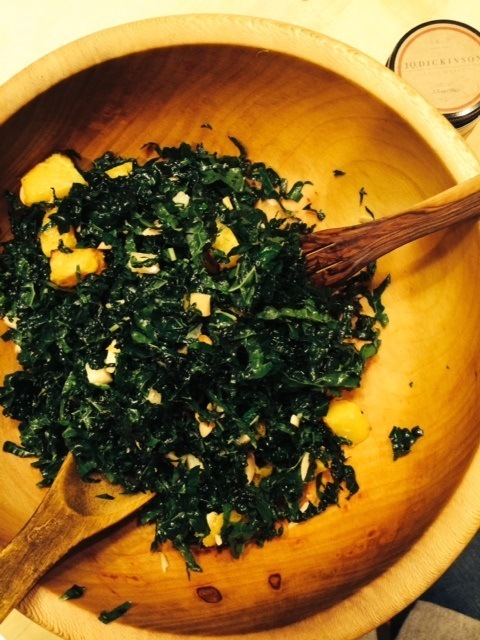 Then I started getting to know kale and found that when prepared correctly it is a wonderful thing. Kale is tough! That’s how it survives the cold weather. We have to help it find its tender side. There are quite a few varieties out there. 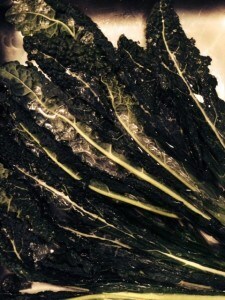 I prefer lacinato, a type of Tuscan “black” kale. Dinosaur, dino, is another Tuscan variety. There are Russian red kales and curly green kales as well. 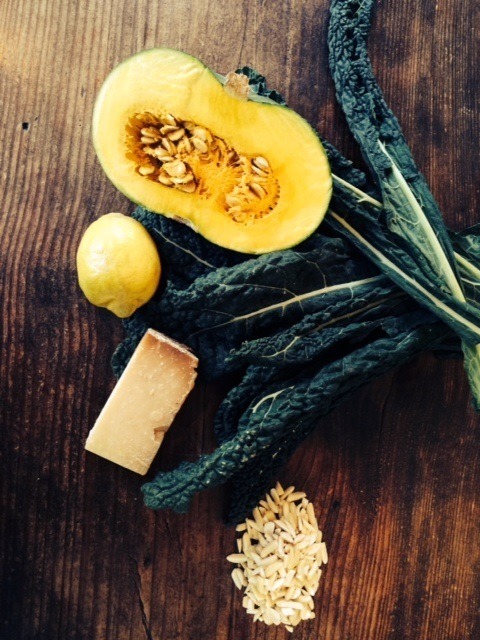 The Tuscan types tend to be sweeter, less fibrous and work best when eaten raw. 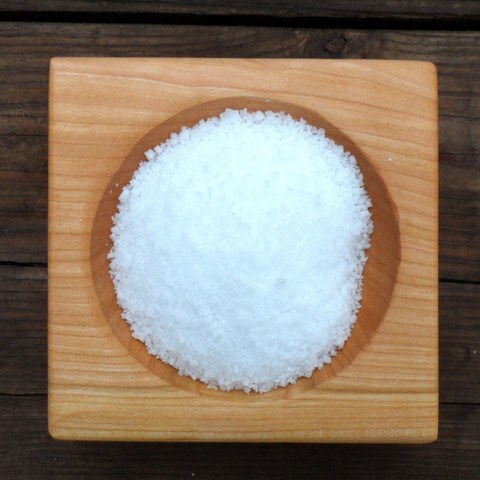 Our salt is a great match for kale because its bold flavor, and crunchy texture, enhance the best qualities of the leafy green. I have served this salad at several dinner parties recently and it never fails to get lots of comments. Emails arrive the next day requesting my secret. I hope you enjoy it too! Wash the kale well in cool water. Fold leaves in half lengthwise and remove the rib from the thickest end to the thinnest, so only the tenderest part remains in the leaf. Dry the leaves in a salad spinner or cloth. 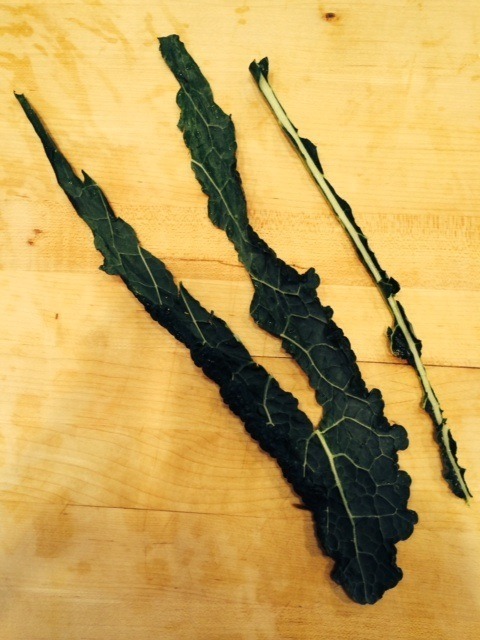 Working in batches on a cutting board chiffonade, finely slice, the leaves. 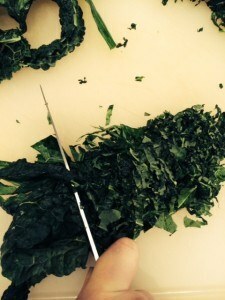 Stacking several leaves and rolling them together to slice helps this go more quickly. Place the kale in a mixing bowl. Place the lemon juice and 2 Tbs of olive oil in a small bowl. Whisk quickly to emulsify. Immediately pour onto the kale. 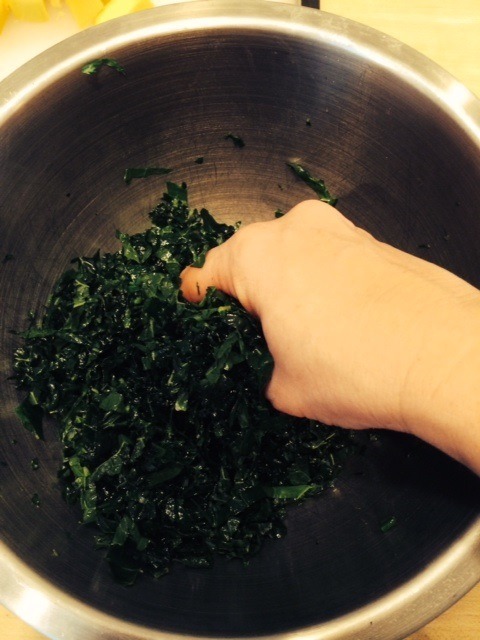 Using your hands gently massage the dressing into the kale for about 30 seconds. Cover and put in the refrigerator for several hours. This is where the kale finds its tender side. Carefully cut your squash in half and peel it with a sharp knife. Scoop out the seeds with a metal spoon and discard, or save for another use. 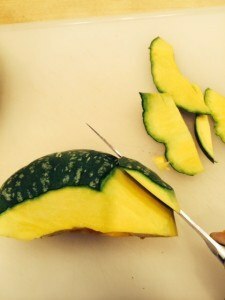 Cut the squash into ½” cubes. Place in a large bowl and toss with 1 Tbs of olive oil. Spread on a baking sheet. Sprinkle with salt and pepper. 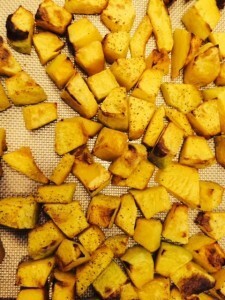 Roast the squash for about 30 minutes until it is just tender and the edges are browned. 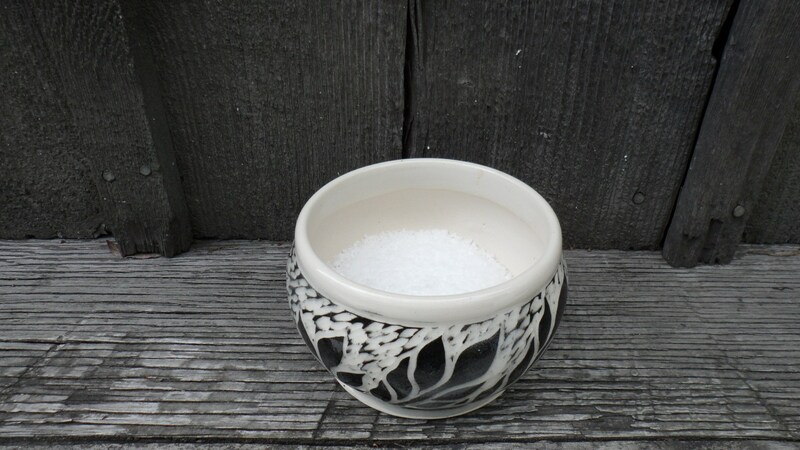 Stir once after 20 minutes. Let it cool. 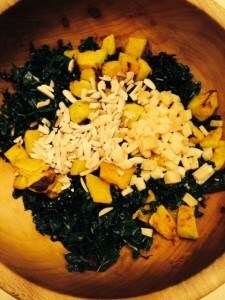 Set one cup of the squash aside for the salad and save the remaining for other uses. Toast your almond slivers for 6-8 minutes in the same oven until lightly browned. Finely chop, or crumble, the cheese. When you are ready to serve the salad place the marinated kale in a serving bowl. Add the squash, almonds and cheddar cheese. What temperate do you use to roast the squash? It’s 375 degrees. I hope you enjoy! Our family has a long history in Malden and has known of the Dickinson family for many years. we have the Andrew donnally family in our heritage line who made part of his fortune in shipping up and down the Kanawha river. 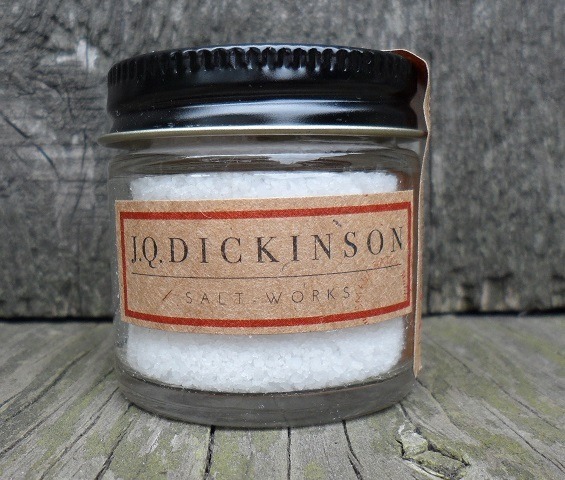 ; I was so happy to come across this product and have ordered salt for each of our children. my aunt owned the house at 3212 malden drive for many years. I wish you much success and will visit your web site again. Thank you so much for taking the time to contact us! We always love to hear stories about how other people are connect to the history of the industry. 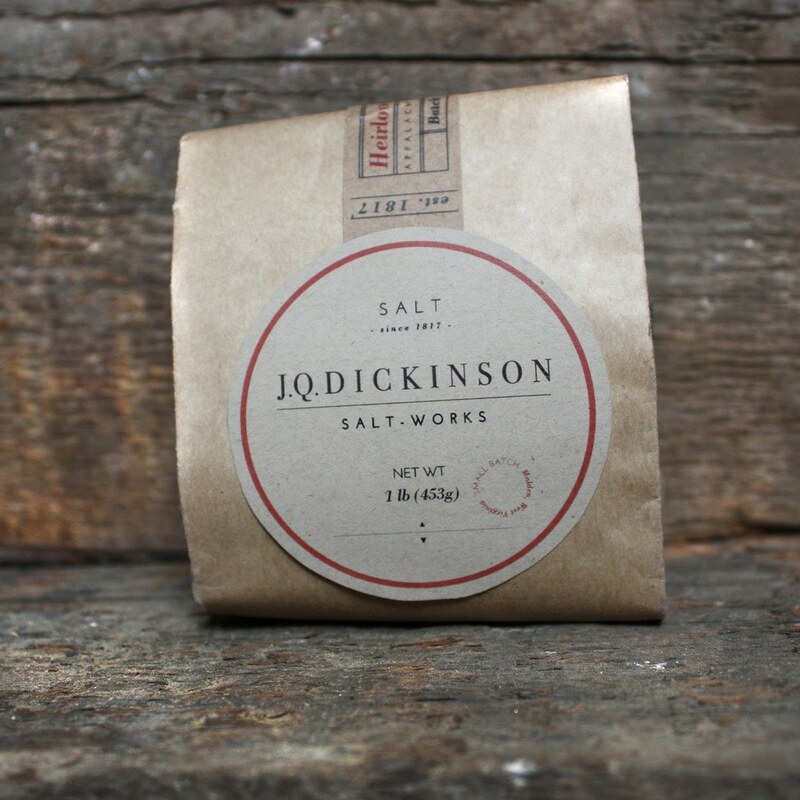 We greatly appreciate that you are sharing the salt with your children.